Who put the freaking sauce on there? Photo courtesy of Chet Duran. That’s it! No more chicken for you! The sauce that freaks out. Are you clucking kidding me? So freaking good, it was required to be censored. The sauce is in a really fowl mood. Warning: This food may be nuts. The chicken is so angry, it wants freaking sauce. I’m Rick James and I approved this message. The chicken is fried and the sauce is freaking. They both need to get into rehab. 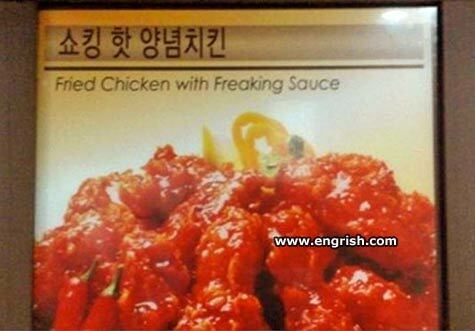 It’s called Freaking Sauce because it made from Kim Jong Un’s opponent. That sauce does look freaking spicy. You should try Rick James’ chicken recipe, It’s Super Freaky. It’s the best sauce when you’re having a bird. The only chicken dish that can get you free long distance telephone calls. I would have thought a rude and unreasonable chicken, would require a very polite and amenable sauce.. It is not sauce. It is red Araldite. This is a meal that will really; “stick to your ribs”. BTW. I bet you never thought you could use MSG – C5H8NO4Na. Actually. Tom Lehrer did miles better. Why are you freaking out? You chicken? As seen in Kentucky fried movie. Your chicken comes with sauce? Well la de freakin’ da! – Waiter, I’ll have the fried chicken with freaking sauce, a bleeping salad as well as the blasted water. Make it the same for my wife. – Excellent flipping choice, sir! Hey, Waiter! Where’s my freaking sauce? !